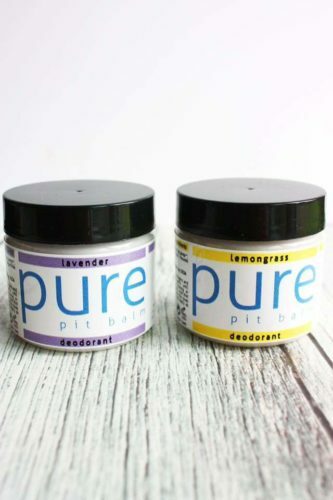 This is an all-natural, 71%+ organic deodorant balm made with certified organic coconut oil, certified organic arrowroot powder, and baking soda, plus essential oils for the scented versions. It contains no parabens, aluminum, or toxins of any kind, which are typical in commercial deodorants and antiperspirants. It is safe, effective, and pure enough to eat! Since the balm is made from all natural, mostly organic ingredients, it is completely safe for both people and the environment. Since all the product is consumed, there is no waste except for the container, which can be recycled. Unscented (natural coconut scent), Pink Grapefruit, Lemongrass, Lavender, and Sensitive Unscented. While the ingredients are imported from overseas (unfortunately coconuts do not grow in B.C.! ), the product is made locally in Coquitlam, B.C. This product is available online and also in local wellness and fitness studios, including Inlet Wellness Gallery in Port Moody, Healing Cedar Wellness in Port Moody, Oxygen Yoga in Port Moody, Coquitlam and Maple Ridge, Kushala Yoga in Port Moody, Move Yoga in New Westminster, Yuens Martial Arts in Coquitlam and Port Moody. After years of trying various natural deodorants that just did not work, including sticks and salt stones, I finally threw in the towel and resorted to making the stuff myself...and much to my surprised, it works better than even commercial deodorants I used to use!